Are you ready for my blog candy give-away tomorrow? These are the goodies I'll be giving away! This week's winner will receive the Note of Thanks Mini Note Kit and a spool of So Saffron 5/8" grosgrain ribbon (10 yards). 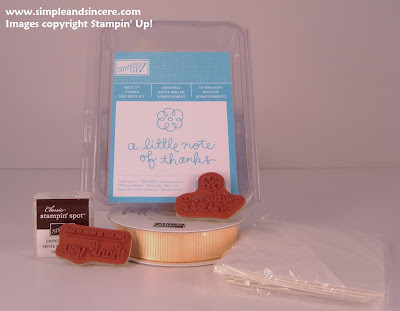 The mini note kit comes with 2 images (double mounted), a Chocolate Chip Classic Stampin' Spot and 4 Whisper White Gift Notes and Envelopes. You'll have everything you need to make a batch of cute lil' thank you notes! Stop by tomorrow and leave me a comment (make sure your name and last initial are in the comment somewhere if you choose an "anonymous" identity) to be entered in the drawing. Only one comment per person, please. :) I'll be randomly choosing one winner on Saturday morning at 6:30a.m. using Random.org. Good luck! Oh, and you'll want to stop by anyway, since I have something super cute to share. See you tomorrow! What great blog candy! Thanks so much for sharing your ideas on your blog. I check your blog frequently! Wonderful blog candy ! I love your blog ! Thanks for the inspiration. Who can resist a little blog candy. It has fewer calories. Love your ideas & as a former Middleton resident, can't help but follow you. I'd love to win!! I recently found your blog & I love the simple creations. Sometimes "less is more!" I love to check out your blog. Thanks for sharing! Very happy with all the inspiration you provide on your blog. Thanks for the same. Thanks also for the chance to win. Priya V.
Looks like some good blog candy. I love the little purse with the candy in it - but now I'm really hungry for nuggets! Happy Mother's Day, Jen!